Como Square – Then & Now, an exhibit of photographs from the early 1900s to the present of Hot Springs’ historic community square, opens Sept. 7 at the Landmark Building, 201 Market St.
Photographs highlight the 100-200 blocks of Central Avenue, Ouachita Avenue, Market and Olive Streets. The exhibit also showcases artwork of the historic structures and venues visited by tourists staying at the Hotel Como and other hotels around Como Square. The artwork was curated from local artists, Hot Springs National Park’s Artist in Residence permanent collection, and the estate of Catherine Thornton. The photographs are from the Garland County Historical Society. Local artists represented in the exhibit are Hugh Dunnahoe, Jeri Hillis, Hildegard Honold, Gary Simmons and Chuck Smith. The Hot Springs National Park artists represented include Susan Crum-Cox, Julie Denesha, Ann Ehringhaus, Catherine Hillis, Carla Johannesmeyer, Karen Michno, Alison W. Parsons, Jennifer Perren, Diane Rubacha, Helen Stannard, Richard Stephens and Steve Whitfield. The opening reception for the exhibit is Friday, Sept. 7, 5-8 p.m. The Hot Springs Village String Quartet will perform 5:30-7 p.m. and a guided tour of the exhibit will be given at 7:15 p.m. The exhibit runs Sept. 7-Nov. 30, Monday-Friday, from 9 a.m.-4 p.m. and on Gallery Walk First Fridays. 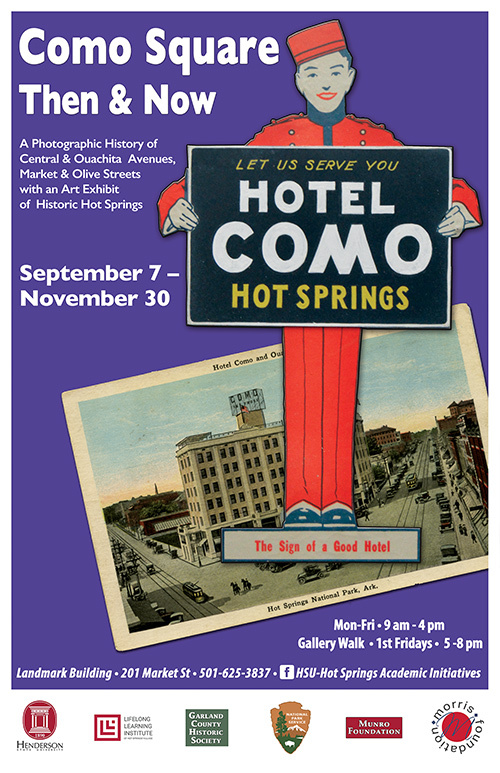 COMO Square – Then & Now is sponsored by Henderson State University–Hot Springs Academic Initiatives, Garland County Historical Society, Hot Springs National Park, Morris Foundation, Munro Foundation, and Hot Springs Village Lifelong Learning Institute. For more information, call 501-625-3837 or visit the Facebook page: HSU-Hot Springs Academic Initiatives.